Larry Gross, Executive Director of the Coalition for Economic Survival , says the lack of guaranteed rental protection is a pervasive problem that threatens the financial stability of hundreds of thousands of low- and middle-income families around Southern California. Los Angeles is the least affordable housing market in the United States, according to authorities at UCLA. City Council members are calling a state law part of the problem. The Ellis Act allows property owners to evict long-time tenants from rent-controlled units - even if they're elderly, poor, disabled or military veterans. 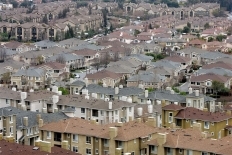 San Francisco officials challenged the real estate lobby in Sacramento and worked some changes. Could LA do the same? 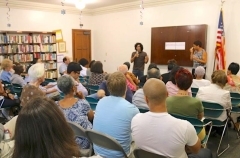 Then L.A. City Council candidate (Now Council Member) David Ryu speaks in April at a rally organized by Larry Gross, right, with the Coalition for Economic Survival, for residents of the Villa Carlotta apartment building on Franklin Avenue in Hollywood. 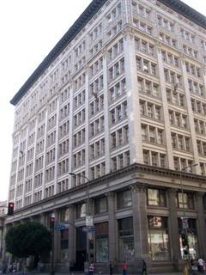 Ryu pledged to oppose turning the building beloved by tenants into a hotel. Both Ryu and his opponent Carolyn Ramsay signed a pledge pressed on them by CES member and Villa Carlotta tenant leader Sylvie Shain. 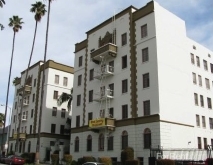 Villa Carlotta is a Hollywood apartment building that has become the center of protests after new management revealed plans to evict tenants and convert the rent controlled building into a hotel. The pledge stated they would oppose a zoning change or any conversion of the building. "These sorts of projects are helping to gentrify the community. These things have a spiral effect. It sends the message for other developers - that they can come in and do the same," Gross said. He added that the Mid-City West Community Council sent a strong message to the community and other developers by opposing Jacobs' project. "This is a very strong statement from the community that they don't want unjust projects in their communities," Gross said. 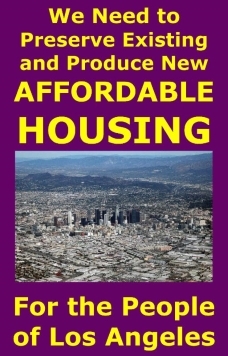 Larry Gross, executive director of the nonprofit Coalition for Economic Survival in Los Angeles, said the state court ruling is a huge victory but "it doesn't solve the problem at hand in regard to the ability of Los Angeles to pass an inclusionary ordinance" for rental units. "It's one piece of the puzzle." All these affordable housing measures are meaningless unless existing affordable housing is preserved, he said. In 1986, the state passed the Ellis Act that allows landlords to get out of the rental market and convert units to condominiums. "Since 2001, 19,000 rental units (in Los Angeles) were lost due to the Ellis Act," Gross said. "The city has only built around 10,000 in that same period of time. That's a net loss of 9,000. Clearly, there's no way we'll ever be able to build our way out of our housing affordability crisis." CES' Joel Montano (left) addresses the crowd as Rep. Karen Bass (right) looks on. Coalition for Economic Survival Affordable Housing Lead Organizer Joel Montano spoke about the need to amend the state Ellis Act and the Costa-Hawkins Housing Act in order to preserve affordable housing ant prevent tenant displacement at U.S. Congress Member Karen Bass' Mid-Cities Congressional Conversation constituent community meeting on June 20. The Congress Member's office had contacted CES to request our participation. 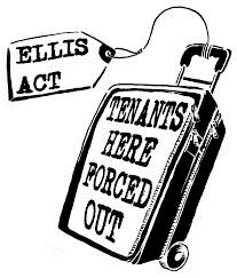 The Ellis Act allows landlords to evict tenants to go out of the rental business and the Costa-Hawkins Act prevents local government from strengthening its rent control laws and restricts the ability to enact strong rent laws. 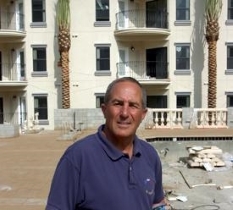 CES Organizes Sun Valley Tenants to Win Repairs and Respect from Management Co. Coalition for Economic Survival Affordable Housing Lead Organizer Joel Montano and CES Occidental College intern Reilly Brown have been organizing tenants at Runnymede Holiday Apartments, a 40-unit Sun Valley complex, consisting of both HUD assisted and rent controlled units, to deal with property management issues. Tenants have been concerned about a lack of response to repair requests, general building maintenance, and the lack of respect in the treatment of tenants. 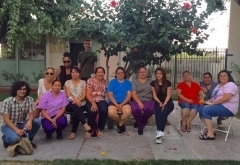 Tenants obtained a meeting with the management company's Director of Operations and won a commitment to improve conditions. The tenants' victory was demonstrated by the fact that repairs have already begun and building policies have been improved, such as providing tenants with rent receipts. Make a Donation to CES, NOW! 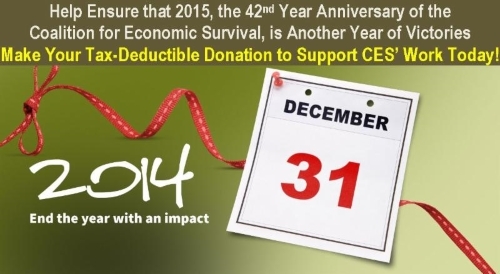 Show your support for the work of CES by making a year end Tax Deductible Donation Now! 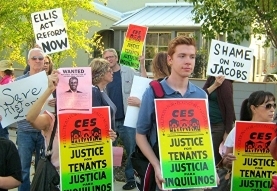 The economic justice victories that CES has won over the years such as rent control, creating the city of West Hollywood and winning numerous laws to combat slum housing, secure tenants' rights and preserve affordable housing has only been possible with the generous financial support from people like you. As CES begins its 40th Anniversary year, help make 2013 another year of victories by donating now. 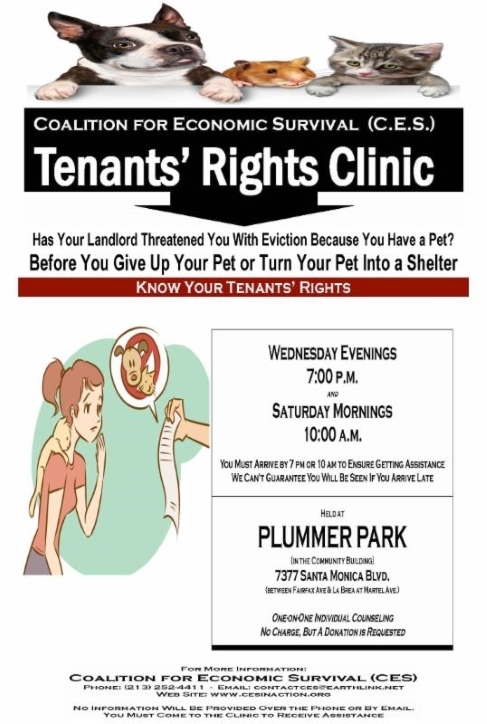 Tenants are welcome to come to CES' Tenants' Rights Clinic held every Wednesday evening at 7 pm and Saturday morning at 10 am in the Senior Center located in the Community Building in Plummer Park, 7377 Santa Monica Bl, West Hollywood (just west of La Brea, between Vista St. and Fuller St. at Martel Ave.). There tenants will be assisted on a one-to-one basis by one of our experienced and knowledgeable volunteer attorneys and counselors. No appointment is needed. It is first come, first serve. Supporting CES' work couldn't be easier: through the Ralphs/Food-4- Less Community Contribution Program, each time you use your Ralphs or Food-4-Less Rewards Card, a portion of your total purchase is donated to support CES' work. This donation in no way takes away from your individual rewards earning. Registration is quick, easy and free. Contact CES at (213)252- 4411 or contactces@earthlink.net and we will explain how to register to support CES' work while you shop. L.A. City Council Member Gil Cedillo's Housing Workshop With CES and the L.A. Housing Dept. 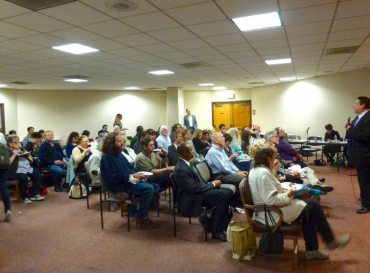 On March 12, the Coalition for Economic Survival co-sponsored a Housing Workshop with Los Angeles City Council Member Gil Cedillo, the LA Housing and Community Investment Department and the Housing Rights Center in Highland Park. 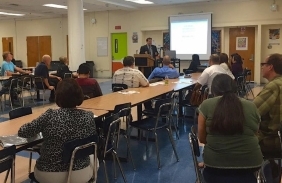 Residents who attended the workshop, held at Benjamin Franklin High School in Council District 1, had the opportunity to ask a lot questions regarding rent control, tenants' rights, affordable housing, the Ellis Act and Fair Housing. The Coalition for Economic Survival has been assisting tenants at the 101-unit Los Angeles Gardens HUD-subsidized scattered-site apartments. The complex spans over the Adams-Normandie, Exposition Park, West Adams & Pico-Union neighborhoods. 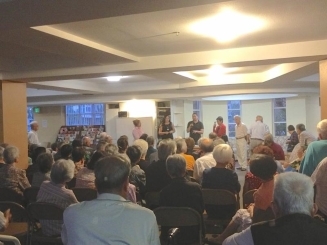 Residents at an 11-unit LA Gardens building in the Adams-Normandie neighborhood, gathered recently to celebrate their victory of getting the agreement of management to translate extensive updated house-rule documents into Spanish and Korean languages. 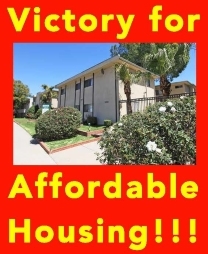 This victory came after CES helped the tenants organize to negotiate with management after they were originally provided with documents impacting their tenancies only in English. 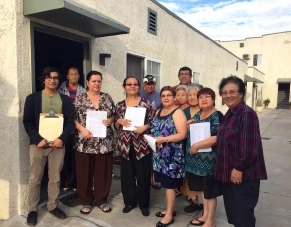 This basic right to know victory will help ensure that all the LA Gardens tenants, who are mostly Spanish & Korean speaking, understand what they are being asked to sign. Californians pay a larger portion of their incomes toward housing, which has increased the supplemental poverty measure, a key gauge of poverty that takes housing costs into account. California's rate of poverty by this alternative measure is 23.4%, the highest in the country. High housing costs have also led to delays in home purchases, more debt, longer commutes and a higher propensity toward living in crowded conditions, the report found. A True Profile in Grass Roots Leadership Development. Abbe came to the Coalition for Economic Survival to get involved in our West Hollywood Cityhood Campaign. 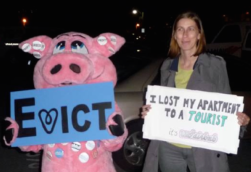 Through her activism with CES she became CES' West Hollywood Chapter Legislative Chair and then CES' Chapter Chair. In that position, she was appointed to the West Hollywood Planning Commission. 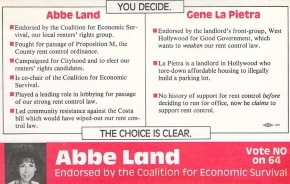 When a seat on the West Hollywood City Council became vacant, Abbe was the natural choice to become CES' candidate for that seat, which resulted in a landslide victory. The rest is history. Thank you Abbe for your service. What appears to be an amazing concert is coming up and the Grammy Museum has asked CES to help get the word out. The Grammy Museum in partnership with Robert F. Kennedy Human Rights, will celebrate the launch of their Speak Up, Sing Out songwriting contest with The Concert For Social Justice on April 8, 2015, at the Fonda Theatre in Los Angeles. 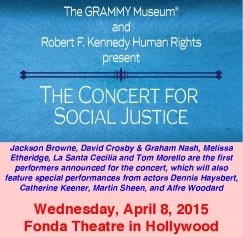 Jackson Browne, David Crosby & Graham Nash, Melissa Etheridge, La Santa Cecilia and Tom Morello are the first performers announced for the concert, which will also feature special performances from actors Dennis Haysbert, Catherine Keener, Martin Sheen, Chad Lowe and Alfre Woodard, and the winner(s) of the Speak Up, Sing Out songwriting contest. Tickets are $55 and can be purchased online at FondaTheatre.com or AXS.com. Purchase tickets by phone by calling AXS at (888) 929-7849. Tell Gov Brown to Restore the Renter's Tax Rebate! Nearly 500,000 households relied on the "Renter's Rebate" to pay the rent, buy groceries and get crucial medical coverage. With rents skyrocketing all over the state, the lack of such basic assistance is an outrage. California has its first budget surplus since the program was cut. And Governor Brown and the California legislature can immediately restore the Renter's Rebate by funding it in the new state budget. But they'll only do it if you demand it. 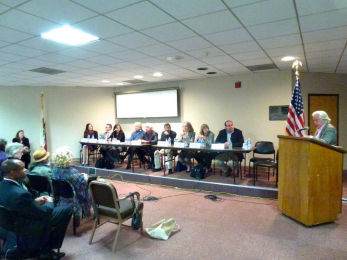 On Tuesday, February 9, the Coalition for Economic Survival, Americans for Democratic Action SoCal, Stonewall Democratic Club and Progressive Democrats of the Santa Monica Mountains sponsored a Los Angeles City Council District 4 Candidates Forum at a packed Van Nuys State Building Auditorium. 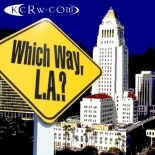 Noted KPFK radio host Ian Masters moderated. Candidates responded to questions from three panelists from the sponsoring organizations, including CES Executive Director Larry Gross. The questions from CES related to support for rent control and housing code enforcement laws, curbing the Ellis Act to preserve existing affordable housing and prevent tenant displacement, earthquake retrofit cost pass-throughts to tenants, AirBnB's impact on the loss of affordable housing, stopping tenant evictions at the 50-unit Villa Carlotta Apartments in Hollywood. A representative from CES' ally UNITE-HERE Local 11 posed a question on raising the minimum wage from the audience. 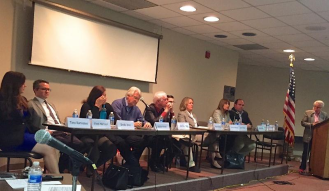 The Council District 4 candidates who participated in the Forum were: Tara Bannister, Sheila Irani, Wally Knox, Fred Mariscal, Tomás O'Grady, Joan Pelico, Carolyn Ramsay, Ross Sarkissian, Mike Schaefer and Steve Veres. Candidates Teddy Davis, David Ryu, Jay Beeber and Step Jones declined the invitation to attend. The 4th District reaches into Koreatown and Mid-Wilshire on the south; through the Miracle Mile, Fairfax District, and Hollywood Hills into Sherman Oaks on the west; through much of Hollywood and over Cahuenga Pass into North Hollywood on the north; and through Los Feliz and Griffith Park into much of Silver Lake on the east. 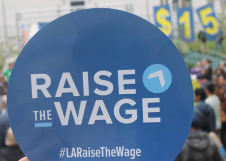 Reporter Emily Alpert Reyes from the Los Angeles Times, who was in attendance, tweeted out candidates' responses to questions CES asked, as well as the one on raising the minimum wage. Below are her tweets so you can see where these candidates stand on the issues. Emily Alpert Reyes: I'm here at another Council District Four candidates forum -- this one held by the Coalition for Economic Survival! Expect questions on housing! Emily Alpert Reyes: This debate has cheesecake. It's clearly the best debate. Question: Would you commit to disallowing cost of earthquake retrofitting to be passed 100% to tenants? Veres: would like to see us add energy efficiency to retrofitting to bring down costs of living in these structures. this is going to be a dangerous situation. If we don't act we're going to be in court. Favor revolving fund. Pelico: I would like to work with state, fed reps and find a way for them to foot the bill. We need to do this now. 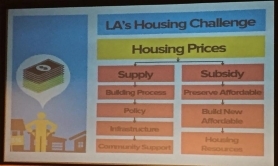 Ramsay: we're short half a million housing units in the County of Los Angeles right now. public safety has to be our number one concern. We have to make this housing safe for the renters. I do not support passing the cost along to the renters. Tax credit is an option. SF has a revolving fund. Sarkissian: making low interest loans available to landlords helps. Should explore state tax credits. Cost sharing needs to happen. Schaefer: retrofitting makes the property worth more. Landlord should pay at least half the cost. Knox: not in favor of the tenants footing the bill. Mayor didn't say how to pay for it. I don't think mayor knows how to pay for it. Nobody wants to be on the hook. retrofitting in such a short time means contractor costs go through the roof. Short timeframe is unacceptable. five years is ridiculous period of time to retrofit soft story. Not sure 7 or 10 is enough. Irani: tax credits good option. Got to explore many options. Should not land on any one funding source. as an urban economist, both tenant and property owner benefit, should be cost sharing, not 100% on tenants' laps. Bannister: tenants should not have to pay for retrofit. Should allow landlords to take it off of biz taxes. we absolutely need to do the retrofitting. Need 7-10 year period for fixes to ease cost. Question: Would you favor restrictions on the demolition of rent controlled and affordable units? Would you oppose the granting of a zoning change to the Villa Carlotta owners? What action would you propose to preserving our existing affordable housing stock and preventing tenant displacement due to things like the Ellis Act and Airbnb? Bannister: Airbnb needs to be taxed like a hotel. no chance I would support zoning change. Should have had to have happened before you got your notice. Mariscal: would like at least 25% of boomerang funds to go to affordable housing trust fund. Irani: if we do agree to zoning change has to be enough relocation aid for everyone. If $$ can't be found, can't change the zoning. need to charge tax on Airbnb, limit # of days converted annually, require notice to neighbors. Knox: affordable housing contracts are now expiring. Will no longer be protected. I will oppose the zoning change. Need to resist destruction of affordable housing. Schaefer: everybody with agenda item before council should list contributions to council members. Make it harder to sell out. I have very little faith in the people on the council. Sarkissian: zone change can be used as leverage to make sure tenants get best possible deal on relocation $$. Says he doesn't know details. Lots of "no"s in audience when Pelico asks if Villa Carlotta tenants got help from Councilman LaBonge. Pelico: I would oppose a zone change to make Villa Carlotta a hotel. Veres: Villa Carlotta eviction notices on Xmas -- unconscionable. Favor modifications to Ellis Act. Would not do zone change on property. Airbnb units are driving up costs throughout city. Would insist on tax on Airbnb. Question: Do you support the City's Rent Stabilization Ordinance (RSO), Systematic Code Enforcement Program (SCEP) and Rent Escrow Account Program (REAP)? Pelico: yes, yes and I love the REAP program. O'Grady says yes, yes and yes. Question: Do you support raising minimum wage to $15.25? O'Grady: don't think our biz can afford $15. Do want to raise min wage. Veres: no one that works a full time job should live below poverty line. But min wage has to happen at county, state level. Community college district raised wages of custodians -- on pathway to $15. Pelico: concerned about workers not being able to get programs because making more money. I would like statewide $15 minimum wage. Am in favor of $13.25 locally. Sarkissian: minimum wage should be raised at state, county level. Schaefer: says he'd support mayor's proposal but need exemptions for youth, trainees. Knox: $13.25 as mayor proposed is middle ground. Back the mayor on that. Irani: support minimum wage but not at city level. Small biz will move out of city to Vernon, Glendale. Bannister: problem is we're going to have price inflation. Business people fighting it. Let them take it out of their biz tax. 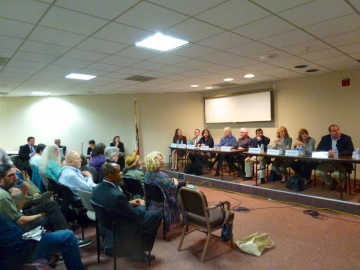 Along with affordability, candidates were also quizzed on environmental policy and LGBT rights during the forum in Van Nuys, which lasted three hours. The primary election is March 3. Unless one candidate wins a majority of the votes, the top two vote-getters will compete in May. The questions were posed by representatives from Americans for Democratic Action, the Stonewell Democratic Club, and the Coalition for Economic Survival. 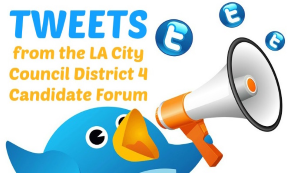 Candidates for the Los Angeles City Council's District 4, which stretches from the Miracle Mile to Van Nuys will answer questions about housing and affordability during a forum by rent control advocates Monday night in the San Fernando Valley. "I don't think these questions have really been posed to them in any of the (previous) forums," said Larry Gross, executive director of the Coalition for Economic Survival. "You have progressive organizations raising progressive questions at this forum." 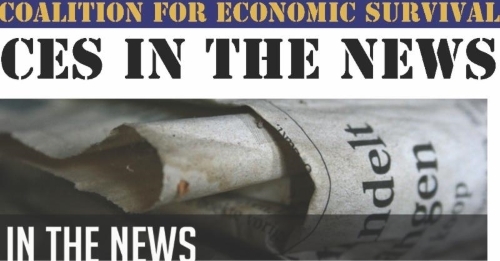 Over the Last Couple of Days the Coalition for Economic Survival has Been in the News Responding to New & Increased Threats to Affordable Housing. Here's Some of the Articles. Some are worried about the burden on tenants, who under current law could see their rents go up as much as $75/month to pay for retrofit costs in an already high-rent city. "Should tenants pay somewhat? We're open to that, but the question is, how much more can tenants pay?" asked tenant rights advocate Larry Gross, executive director of the Coalition for Economic Survival. Back in 2012 when the city was considering a hike in parking citation fees, Larry Gross, executive director of advocate group, Coalition for Economic Survival, told the L.A. Times that he felt these tickets "disproportionately affect working-class families in Koreatown, Westlake and other neighborhoods packed with apartment buildings and too few parking space." 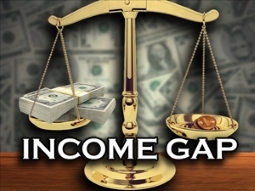 "The burden is felt hardest by those who can least afford to pay," Gross said. Make a Year End Donation NOW! We thank you for you support and ask that you consider providing your continued support for the work of CES by making a year end Tax Deductible Donation Now! To donate with a check or money order, click here. 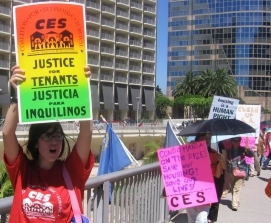 The economic justice victories that CES has won over the years such as rent control, creating the city of West Hollywood and winning numerous laws to combat slum housing, secure tenants' rights and preserve affordable housing has only been possible with the generous financial support from people like you. As CES begins its fifth decade, help make 2015 another year of victories by donating now. 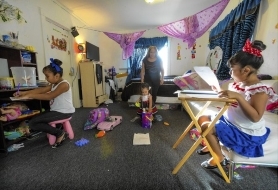 Renters' groups fear widespread displacement of residents who can't afford the extra rent, particularly those in wood-frame buildings with weak first floors over carports - a key source of low-income housing in Los Angeles. Gross and other tenant leaders are pressing the council - in an election year - for greater cost protections for renters. Over 1,000 people attended 1979 CES rally in West Hollywood's Plummer Park that led to winning rent control. "It (the State Costa-Hawkins Act) ostensibly puts a bullseye on long-term tenants," said Larry Gross, executive director of the Coalition for Economic Survival. "Landlords, many, will do what they can legally or illegally in order to be able to raise the rent." The city's rent stabilization ordinance actually allows for rent increases, which officials said residents often forget. In West Hollywood, landlords can raise the rent by 75 percent of the Consumer Price Index (CPI) each year. West Hollywood rent is set to increase 1.25 percent for 2014-2015. By comparison rents will increase in Los Angeles by 3 percent, Santa Monica by .8 percent, San Francisco by 1.9 percent and Oakland by 10 percent, according to the Coalition for Economic Survival. Through it all, the rent stabilization ordinance is still worth fighting for, Gross said. It is estimated that shoring up these structures can cost anywhere from several thousand dollars to more than $1 million. Gross said building owners are allowed to pass 100 percent of the cost of a retrofit to tenants by increasing rent. However, he noted landlords can only raise monthly rents by $75 under the city's Rent Stabilization Ordinance. "Geoff Palmer is no doubt the symbolic anti-affordable housing developer in the city," said Larry Gross, executive director of the Coalition for Economic Survival, a tenants rights group. "Palmer doesn't want to build affordable units, and he's made it difficult to allow the city to pass laws that require new affordable units be provided in new units built in the city." "What Palmer envisions with his housing is sort of a tale of two cities, where he's catering to the wealthy and well-off and doesn't want to have any responsibility for the poor," Gross said. In the meantime, housing advocates say they increasingly see short-term rentals squeezing the broader housing market, especially when landlords push out rent-paying tenants to run what Bonin calls "defacto hotels." 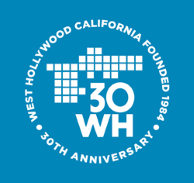 It was 30 years ago that Coalition For Economic Survival members rejoiced in the culmination of their years of hard work in securing tenants' rights and rent control by creating the new City of West Hollywood. This is an important achievement that serves as an example that when you organize and empower people, real change can occur. 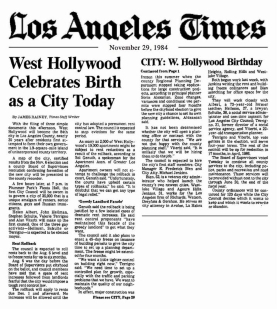 West Hollywood was created by an organized grassroots effort, which CES led. West Hollywood stands as a city built on rent control, and a hope and desire for justice. 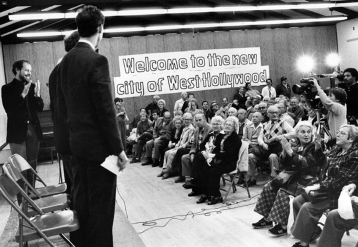 CES Launches the Official Campaign for West Hollywood Cityhood in 1984. 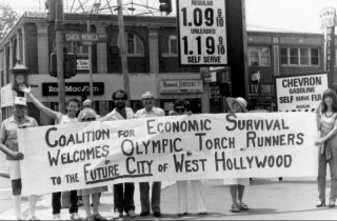 CES Seeks to Win Support for West Hollywood Cityhood by Welcoming Olympic Torch Runners of LA 1984 Olympics on the Corner of Santa Monica Bl & Fairfax Ave.
West Hollywood residents celebrate cityhood at a Nov. 25, 1984 meeting of the Coalition for Economic Survival, which led the incorporation campaign, 4 days prior to the official City Council swearing in. Courtesy of the LA Public Library's Herald-Examiner Collection. What was important about the Mayor's speech was the recognition that we need to link the commitment to providing new affordable housing with raising the minimum wage. For low wage earners providing one without the other is an inadequate formula. Without the wage increase one can't afford the housing, and without the affordable housing a wage increase will only go to the landlord. The other important commitment made by the Mayor was the need to preserve existing affordable housing in addition to producing new affordable Units, as well as protecting the city's rent control law and tenant protections. Over 13,000 rent controlled units have been lost in the City since 2001 as a result of developers using the Ellis Act to convert and demolish these units and build high-priced condominiums and apartments. 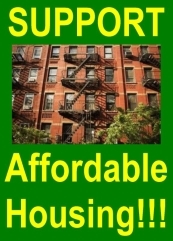 If we don't preserve the existing affordable units then no matter how many units are built they won't meet the need. We will never build our way out of our affordable housing crisis unless there is an equal commitment to preserve existing affordable housing. The Mayor also committed to building 100,000 housing units by 2021. Most of these units need to be affordable, because it has been estimated that LA needs to have 82,000 affordable units built by 2021 in order to meet the demand for such housing. In a city where the majority are renters and most of those renters are currently paying unaffordable rents, CES applauds the Mayor's stated commitment to ensuring that there is adequate affordable housing for the people of Los Angeles. It is going to take this type of leadership, commitment and creativity to truly achieve real equity and economic justice in Los Angeles. In other words, the law currently grants an incentive to projects that result in a net loss of affordable housing. This is inconsistent with the legislature's declaration that "the development of a sufficient supply of housing to meet the needs of all Californians is a matter of statewide concern." AB 2222 is sitting on the Governor's desk, and your voice in support of affordable housing will be the difference between a law or a veto. 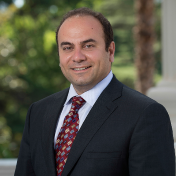 AB 2222, authored by Assembly Member Adrian Nazarian (D-San Fernando Valley) strengthens the state density bonus law by increasing the affordability requirement of all low- and very low-income units from 30 years or longer to 55 years or longer. 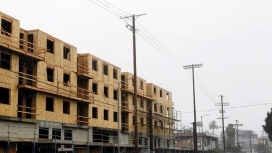 AB 2222 also clarifies state law to expressly prohibit an applicant from receiving a density bonus if the proposed housing development or condominium project will result in a net loss of units affordable to persons and families of lower- or very low-income. Under current law, a development project that includes the demolition or conversion of rent stabilized or affordable units may qualify for a density bonus even if the new project produces fewer affordable units than previously existed on the site. In other words, the law currently grants an incentive to projects that result in a net loss of affordable housing. 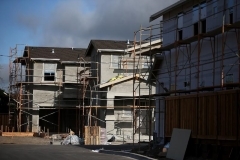 This is inconsistent with the legislature's declaration that "the development of a sufficient supply of housing to meet the needs of all Californians is a matter of statewide concern." AB 2222 has been sent to Governor Jerry Brown for his signature to allow the bill to be put into law starting in 2014. The Governor has not taken a position on the bill but he has roughly a week to sign the measure, veto it or allow it to become law without his signature. Your Help & Action is Needed Now!!! We are asking that you contact Gov. 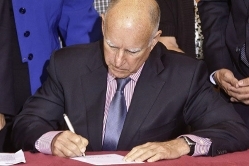 Brown immediately and urge that he sign AB 2222. For homeowners in Southern California, the housing recovery has been pretty kind. For renters, not so much. The data, released Thursday by the Census Bureau, show that the median monthly mortgage payment for a homeowner in metro Los Angeles - L.A. and Orange counties - was $2,241 last year. Adjusted for inflation, that figure has fallen 17.7% since 2007. And the share of homeowners spending at least 35% of their income on housing - a common barometer for affordability - has fallen sharply in the last few years to 30%. CES Tenant Leaders Maritza Guzman has watched as the East Hollywood apartment building where she and her mother have lived for 22 years has emptied out by a new landlord seeking higher rents. For many renters, the prospect of just holding on to what they've got can be daunting. 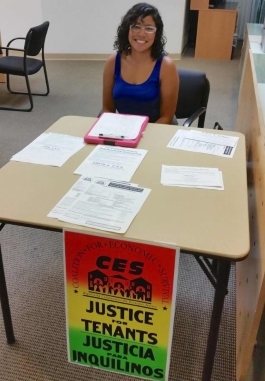 CES Tenant Leader & New CES Tenants' Rights Clinic Receptionist Maritza Guzman says, "There's no way they could afford to buy a house right now." But that's what Maritza Guzman is hoping to do. Guzman has watched over the last year as the East Hollywood apartment building where she and her mother have lived for 22 years has emptied out. New owners are planning a major overhaul, she said, and offering longtime tenants - many in rent-stabilized units - cash to leave. All but four apartments are now vacant, and Guzman said she thought hard about taking the $30,000 she and her mom were offered. But she looked around, saw nothing on the market even close to the less than $900 a month they pay now, and realized that the money wouldn't last more than a couple of years. Article on Raising the Minimum Wage to Keep Pace With Rising Rents. 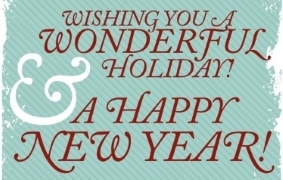 Make a Year End Donation to CES, NOW! 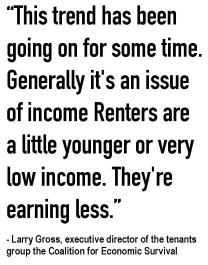 Larry Gross, Executive Director of the tenants rights group, The Coalition for Economic Survival says, "Most renters in L.A. are working people, low-income or middle class people trying to get by and rent control laws provide them with some stability. 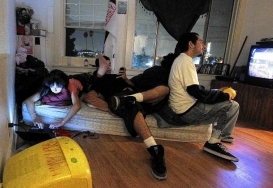 62-percent of renters in L.A. are paying unaffordable rents as it is." There are plenty of people who would think it's unfair Jones pays $700 a month to live in West Hollywood - unfair to his landlord who could be making so much more and unfair to tenants at the mercy of market rates. But Jones doesn't think so. He says whether you support rent control or not all depends on what kind of city you want to live in. "We can't control our rent because of the Costa-Hawkins decision," Santa Monica planning commissioner Sue Himmelrich said. "That really is the pressure on our housing market. Larry Gross, executive director of the Coalition for Economic Survival, on the 1970s apartment market that inspired rent control laws: "It was a crisis situation ... Speculators had found L.A., buying apartment buildings and turning them over. 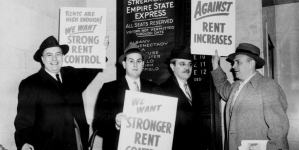 People were receiving three, four, and five rent increases per year." Gross: "It levels the playing field for tenants ... It says you can't evict somebody just because you don't like them." 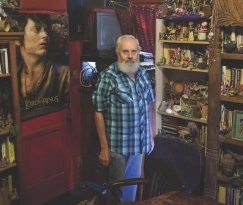 Wendell Jones, who lives in a rent-controlled unit in West Hollywood: "People like me who have things to share with the community, we'll all be driven out if rent control goes ... None of us will be here." Habibi on lack of income restrictions in the current laws: "You could have an attorney making a quarter of a million dollars living in a rent stabilized property ... Meanwhile, someone who makes only a fraction of that is living in a market rate building." Santa Monica Planning Commissioner Sue Himmelrich on California's Costa-Hawkins Rental Housing Act, which outlawed rent control on units built after 1995: "We can't control our rent because of the Costa-Hawkins decision ... That really is the pressure on our housing market." Gross on California's Ellis Act, which allows landlords to evict tenants if they plan to go condo or otherwise repurpose the property: "We've lost upwards of anywhere from thirteen to sixteen thousand units through landlords going out of the rental market to demolish their buildings to build new luxury condos ... Housing will be lost and never replaced." And that report again with the last word: "The purpose of the RSO is to protect tenants from excessive rent increases, while allowing owners a reasonable return on their investments ... This balance is difficult to achieve in a rental market with both long-term decline in renter incomes and inflation in housing prices." 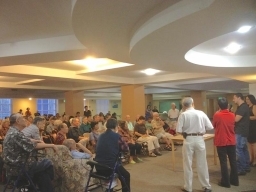 Coalition for Economic Survival (CES) was asked by LA City Council Member Gil Cedillo's office to assist them at a meeting at the 302-unit Grand Plaza Senior Apartments in Chinatown on Aug 20. Tenants at this low-income government assisted building had received a 5% rent increase in June, which may be illegal. The Chinese-speaking tenants had also received a new lease agreement that was 43 pages and in English. CES' Director of Organizing Carlos Aguilar & Lead Affordable Housing Organizer Joel Montano participated in leading the meeting. Little Tokyo Service Center helped with translation. Sharon Lowe, with Council Member Cedillo's office, thanked CES organizers for their help in saying, "You were all great and most definitely helped to put the tenants at ease and helped to de-stress them and put their fears to rest, which was the most important objective of last evening's meeting. They came away knowing they were not on their own, that they had the support of CD 1 and that the City and State were in communications and working on their behalf, and they had CES tenant advocates alongside them to ensure their rights as tenants were protected. They also came away unified and with a constructive action plan." Coalition For Economic Survival (CES) staff members Carlos Aguilar and Lourdes Soto met with tenants at a Koreatown building, with assistance from Bet Tzedek Legal Services Attorney Julius Thompson, to organize them to address threats, intimidation and unlawful evictions they face from an out-of-state investor that recently acquired the building. Tenants have also been exposed to toxic lead and asbestos as a result of the unsafe work practices that was being performed in doing rehabilitation work. Many believe the intent of the new owner is to displace the current low income tenants and replace them with higher paying USC students. Strategies were developed at the meeting to demand safe and habitable housing free from illegal eviction attempts and landlord harassment. 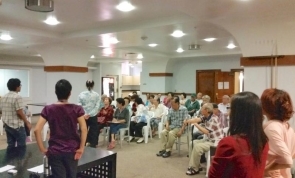 Approximately 50 low-income seniors living at the downtown LA HUD-assisted 299-unit Van Nuys Apartments gathered together with the assistance of the Coalition for Economic Survival (CES) on September 3. The tenants were meeting with representatives of the owner, AIMCO, the nation's largest landlord, to ask questions about living conditions at the building. 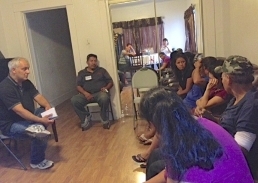 The meeting was conducted in 3 languages, English, Chinese and Korean, to accommodate the needs of the tenants. CES Tenant Leader Lee Chong Suk and Vivian Lee from Little Tokyo Service Center provided translation. Tenants passionately expressed many concerns ranging from ceiling water leaks to broken down kitchen appliances, as well as general poor habitability conditions at the building. During the meeting it came to light that tenant requests for repairs went unanswered for numerous months and there's a need for considerable improvement of the on-site management to better serve the residents. 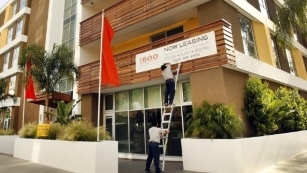 AIMCO representatives pledged to meet with their on-site staff and report back to tenants. Isaac Newton Van Nuys developed the 11-story Van Nuys Apartments in 1913 as a financial center in the heart of Los Angeles. 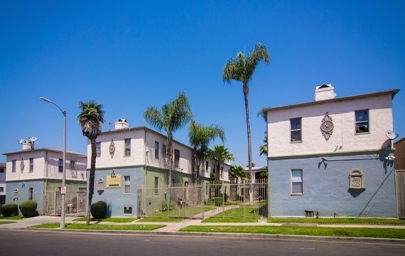 In 1982 the building, at 7th and Spring, was converted into a HUD-subsidized residential complex for low-income senior with funds from HUD and LA's Community Redevelopment Agency. 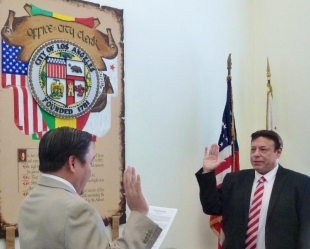 On August 13, the Los Angeles City Council Housing Committee considered Mayor Eric Garcetti's nomination of Rushmore Cervantes for General Manager of the Housing and Community Investment Department (HCIDLA). Cervantes had been serving as the Interim General Manager for HCIDLA and previously was the executive officer at the Department. The Coalition for Economic Survival (CES) has had an extremely good working relationship with Cervantes since he's been at HCIDLA. 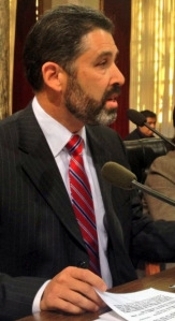 In his testimony CES' Executive Director Larry Gross praised Mayor Garcetti for providing an extremely qualified choice for General Manager stating: "With this City facing a severe housing crisis, particularly when it comes to the lack of affordable housing, you need a special person to lead us. Thus, this position requires someone with a very unique skill-set who is committed to and has the ability to effectively take on these challenges. I believe Rushmore Cervantes is that person and I know he is up to these incredible challenges. Rushmore is well-respected and has the trust of the key stakeholders that are working to address our housing needs." On August 19, the full LA City Council unanimously, on a 14 to 0 vote, confirmed Rushmore Cervantes as the new permanent HCIDLA General Manager. 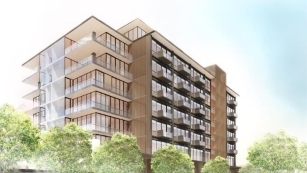 A developer proposed a plan to convert and expand an existing West Hollywood office building into luxury housing that included needed affordable units. The problem was that the plan called for excluding the low-income tenants from having access to all the amenities provided the other residents, as well as having a separate entrance for the tenants. In a sense, the plan called for turning the low-income renters into second-class citizens. The other surprise was this segregated housing plan was proposed for West Hollywood, one of the most progressive cities in the nation. 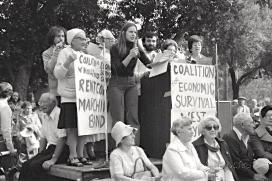 The Coalition for Economic Survival (CES) led the efforts in 1984 to incorporate the city in order to secure a strong rent control law and preserve existing affordable housing. 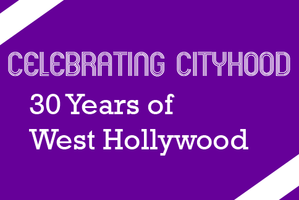 Since its incorporation, West Hollywood has become a leader in the fight against HIV and AIDS, rent control and affordable housing, LGBT rights, human rights and civil rights, women's rights, seniors' rights, protection of our environment, and animal rights. 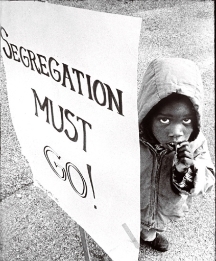 West Hollywood, soon after its incorporation, was one of the first cities to adopt a disinvestment policy with companies and financial institutions doing business with the then racist regime of South Africa to protest its Apartheid practices. 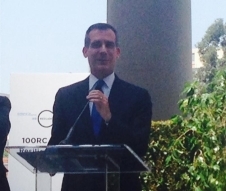 Those policies served as a model for other cities including Los Angeles. Ironically, West Hollywood finds itself facing a form of Apartheid. CES swiftly denounced the plan, together with many others in the community. As CES were developing plans to broaden protest of the plan, the developer retreated from the original proposal. Hopefully the recent outrage will send a message to other developers who might entertain a similar proposal that they too will face strong opposition. CES will continue to monitor and be ready to respond if the need arises in the future. There were two key issues that pushed West Hollywood residents to create their own city three decades ago: gay rights and rent control. 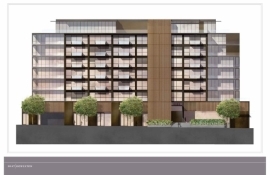 The developer of a proposed large mixed-use building in West Hollywood that planned to restrict tenants living in affordable housing units from accessing the property's pool said Wednesday it will reconsider. A West Hollywood developer says he will reconsider a plan to bar affordable housing tenants from using the amenities in a proposed mixed-use building, reports KPCC. Under the original proposal, renters in affordable units would have been prevented from using the pool in their own building. "I could have never thought that this would come to Southern California, let alone West Hollywood. It's appalling," said Larry Gross of the Coalition for Economic Survival. Coalition for Economic Survival staff and tenant leaders attended the National Alliance of HUD Tenants (NAHT) Conference in Washington DC on June 14-16, 2014. HUD tenants from across the nation are participating in the conference. 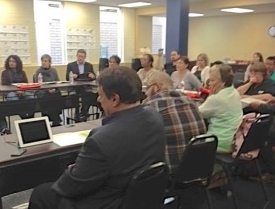 The conference was also attended by US Department of Housing and Urban Development (HUD) officials who responded to issues raised by the tenants. NAHT is multi-cultural, tenant-controlled national alliance of tenant organizations in privately-owned, multifamily HUD-assisted housing. CES is a long-time member of NAHT. 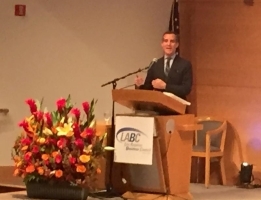 On June 30, 2014, Los Angeles Mayor Eric Garcetti invited community stakeholders, City officials, service providers, businesses, and the non-profit sector to a kick off event workshops to discuss Los Angeles' resilience priorities and begin to develop a shared resilience agenda. CES was one of the invited guests. 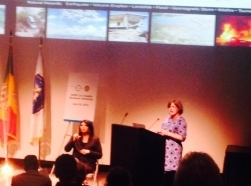 Dr. Lucy Jones, of the US Geological Services and recently appointed by the Mayor as LA's Senior Adviser on Seismic Safety, was a speaker. 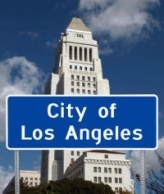 In December 2013, The Rockefeller Foundation announced the selection of the City of Los Angeles to participate in the Foundation's 100 Resilient Cities Centennial Challenge. The 100 Resilient Cities Centennial Challenge seeks to support 100 cities that are ready to build resilience to the social, economic, and physical challenges that cities are increasingly facing in the 21st century. 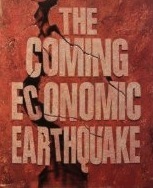 In the break-out sessions, Coalition for Economic Survival Executive Director Larry Gross, noted that while supporting the need to make buildings safe, the burden of paying for the cost of building earthquake retrofitting must not be placed on renters who can least afford to pay increased rents. Potentially 29,000 soft-story apartment buildings that are mostly rent-controlled housing for low and moderate income and working class families could lose their affordability if they are required to be retrofitted. 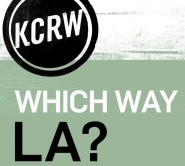 Gross also pointed out that given LA's diverse population, it was imperative that information and access to it be provided in the numerous languages spoken in LA. On July 30, Coalition for Economic Survival members from East Hollywood, Mid-Wilshire, Koreatown and Silver Lake areas attend a recent workshop offered by the Los Angeles Housing and Community Investment Department providing information on LA's Rent Stabilization Ordinance. CES consistently encourages tenants to attend events such as this to empower them, first by learning about what rights they have and then assisting them in exercising those rights to stop displacement, ensure needed repairs are obtained & protect their affordable housing. CES Director of Organizing Carlos Aguilar has been working with these tenants to address issues at their buildings and neighborhoods. 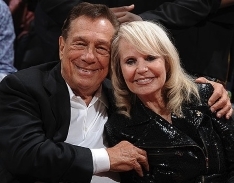 While the Court Ruling on Donald Sterling's Sale of the LA Clippers was Good, CES is Concerned if Shelly Sterling has a Continued Involvement With the Team, It Will Mean the Clippers and NBA Have Failed to Acknowledge Her Racist, Slumlord and Housing Discrimination Actions. Coalition for Economic Survival Executive Director Larry Gross, together with American Federation of State, County and Municipal Employees (AFSCME) Local 3634 Administrative Assistant June Singleton-Reece, appeared on KNBC Channel 4 News on May 1, 2014, regarding a story on how the affordable housing crisis has pushed middle class, working families and the poor out of the City of Los Angeles. As a result people now find themselves spending hours on the freeways commuting from their homes to their jobs. June lives in Ontario, 68 miles from her job in LA's Koreatown. She's spends 3 hours driving to work, thus reducing her quality of life and adding to the areas air pollution problem. CES says the the solution lies in the creation on more jobs and aggressive action by government to produce new affordable housing while preserving existing affordable housing by restricting condo conversions and demolitions of rent controlled affordable units. KTTV Channel 11 FOX News commercial clip with Coalition for Economic Survival Executive Director Larry Gross promoting an investigative report, "Tenant Troubles." The clip ran over and over on Channel 11 leading up to the airing of the report. The story investigates the intimidation tactics some landlords use to force tenants to move so landlords can raise rents and avoid paying required tenants relocation assistance money. This case focuses on a new owner who went so far as to set the building on fire to clear out tenants. 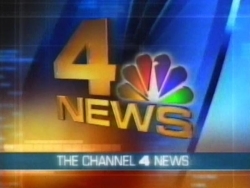 The report aired on Monday, May 19, 2014 on Los Angeles' FOX News Channel 11 at 10 pm. Long before the scandal broke two weeks ago. 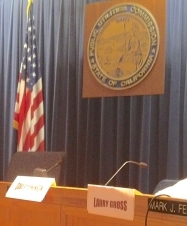 Larry Gross, executive director of the Coalition for Economic Survival, boycotted Clippers games. 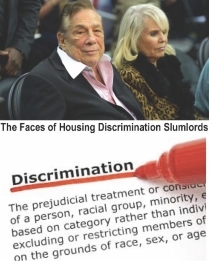 The Sterlings have an abysmal record, Gross said, pointing to discrimination lawsuits filed by tenants. 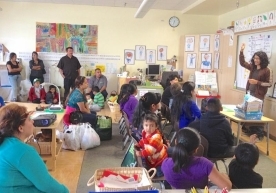 The Coalition for Economic Survival was by invited Para Los Niños to participate in the Partnerships for Families and Parent Advisory Council Community Resource Fair on Saturday, April 12. CES Lead Affordable Housing Tenant Organizer Joel Montano conducted a workshop on Tenants' Rights, Housing Code Enforcement and Tenant Association Organizing for the parents. 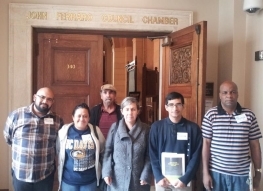 Coalition for Economic Survival Members attended and testified at a California Public Utilities Commission's Low Income Oversight Board (LIOB) meeting, held on May 22nd in the Los Angeles City Council Chambers at LA City Hall. 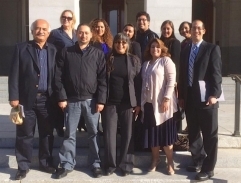 CES tenant leaders testified to the benefits of the recent victory in which the PUC recently established LifeLine discounted cell phone rates for low-income consumers, making it now possible for them to own mobile phones. A number of the CES members had participated in previous PUC hearings where they advocated for establishing the cell phone LifeLine rate program. Left to Right: CES Tenant Organizer Edward Gutiérrez, CES Tenant Leader Roxana Monroy, CES Tenant Leader Agustin Cebada, CES Tenant Leader Eva Gutierrez, CES Affordable Housing Lead Organizer Joel Montano, CES Tenant Leader Burnett Grier. CES Executive Director Larry Gross is a PUC appointee to the LIOB, serving on the Board since January 2012. Board Member Gross thanked the CES members for testifying and for their involvement in the effort to bring about this important victory for low-income Californians. 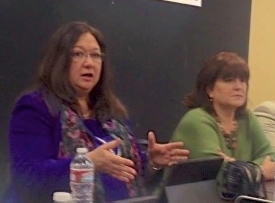 PUC Commissioner Catherine Sandoval, who is the assigned Commissioner to the LIOB and was a driving force to establish mobile LifeLine phone rates, stressed the importance of CES members' involvement. The LIOB was established by the California State Legislature to advise the PUC Commission on low-income utility issues as it relates to investor-owned utility companies and to serve as a liaison for the Commission to low-income ratepayers & representatives. 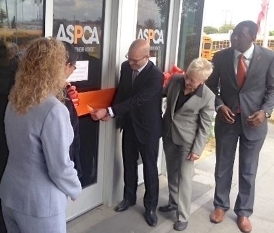 On May 6, Coalition for Economic Survival Executive Director Larry Gross, who is also a Los Angeles Board of Animal Services Commissioner, and CES Director of Organizing Carlos Aguilar, attended the ribbon cutting ceremony of the American Association for the Prevention of Cruelty to Animals' (ASPCA) new free spay-and-neuter clinic at the South Los Angeles Chesterfield Square Animal Shelter. The ASPCA plans to spay and neuter about 4,000 animals at this new facility this year and 6,000 animals next year. LA City Council Member Bernard Parks, who's district the facility is in, LA Deputy Mayor Doane Liu, LA Animal Services General Manager Brenda Barnette and Assembly Member Sebastian Ridley-Thomas' Field Rep. Seth Fowler joined with other LA Board of Animal Services Commissioners, ASPCA officials and animal rights supporters for the clinic opening festivities. Housing at the Same Time!!!!! Check out CES NEW merchandise. T-Shirts, Calendars and now Hats and Messenger Bags. Click here to see what we got and how you can order today. They make great gifts. < You can impress co-workers and friends with this nifty messenger bag that will hold all those important papers for the meeting you're running off to. Read the two following articles (LA Times & LA Business) about threats to tenants & affordable housing due to the State Ellis Act. 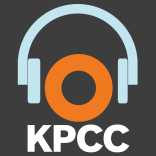 Also, listen to a radio program (David Cruz Show) on the challenge renters face because of our housing crisis. An increasing number of rent-controlled units are being converted to condos or simply flattened, leaving a dwindling supply and fewer affordable options for residents. "The people who make Los Angeles run — such as the hotel workers, the service workers, the teachers and the bus drivers and the regular working people — are being run out of Los Angeles," said Larry Gross, executive director of the Coalition for Economic Survival . POLITICS: Proposal would limit owners' ability to sell properties. 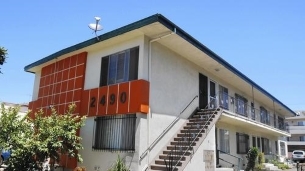 Larry Gross, executive director of L.A. tenant rights organization Coalition for Economic Survival , said that in the past three years, more than 1,000 rent-controlled units have been taken off the market in Los Angeles, with many of those going through the Ellis Act eviction process. He expects the pace of such evictions to increase as housing pressures mount, particularly on L.A.'s Westside. 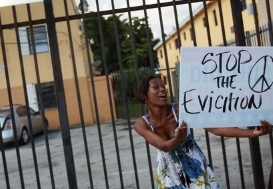 "We have a tidal wave of Ellis Act evictions on the horizon," Gross said. "What's happening now in San Francisco will soon happen here, unless action is taken. We need this legislation now, not after the fact, because once we lose those rent-controlled units, we will never get them back." 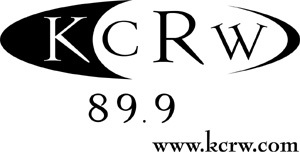 Coalition for Economic Survival Executive Director Larry Gross was interviewed by David Cruz, host of KEIB radio's the David Cruz Show, on Saturday, April 12, 2014. They discussed the need for renters to be wary of today's rental market, the challenges renters face in finding a affordable apartment and the need for tenants' to know their rights. CES has recently gained significant media attention in numerous media outlets and newspapers regarding a number of issues affecting tenants and affordable housing. We wanted to share these news reports with you. Affordable housing advocates say the improper conversion of a South L.A. building which tenants now must vacate is 'not an isolated case. As Southern California recovers from the Great Recession, the Middle Class is being priced out of the housing market. Increases in income aren't beginning to keep pace with the skyrocketing home prices -and that, in turn, makes it more expensive to rent. Are urban centers becoming enclaves for the wealthy while others flee to the suburbs? If you're actively looking to buy a home in Southern California, you won't be surprised by the real estate website Trulia report. Los Angeles, Orange County and the Inland Empire are three of the country's five most overpriced housing markets. And here's the kicker: housing prices are soaring - but incomes are not keeping up. Parks' proposal is intended to incentivize retrofitting by allowing landlords and would make it legal for tenants to pay the whole cost of rehabilitation over a "reasonable period of time." 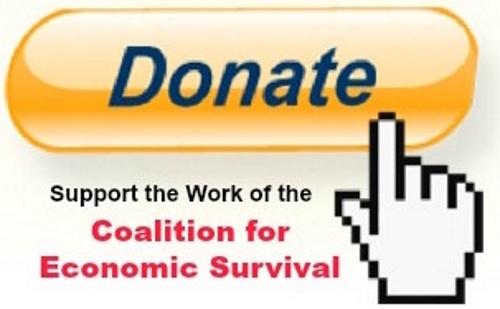 The Coalition for Economic Survival, Co-Hosted at its Office, a community briefing on the recent LifeLine discounted wireless phone rate victory, together with the San Francisco-based The Utility Rate Network (TURN) and the American Association of Retired Persons (AARP). Attending the meeting to explain the victory, as well as to outline additional issues that need to be addressed was California Public Utilities Commissioner Catherine Sandoval. Representatives from community and consumer groups from throughout Southern California participated in the meeting. Catherine Sandoval explains LifeLine Victory. The LifeLine victory will keep low-income customers connected to affordable, reliable phone service whether they chose a mobile or landline plan for discounted service. In a landmark decision, the California Public Utilities Commission (CPUC) also agreed with the groups involved in this broad-based statewide campaign that included CES and that was led by TURN that Californians without social security numbers should not be disqualified from the state program. California is the first state in the U.S. to eliminate the requirement. Customers will have the option to use their LifeLine discount on basic voice and text services or choose bundles and wireless family plans. 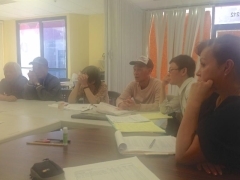 Coalition for Economic Survival HUD Tenant leaders met at their Pasadena building on March 20, 2014. The tenants live at the 10-unit Northwest Manor I scattered-site IV Apartments. At the meeting tenants strategized on ways to convince the landlord to take action to address the severe roach infestation, make necessary plumbing repairs, and ultimately implement more proactive pest control. 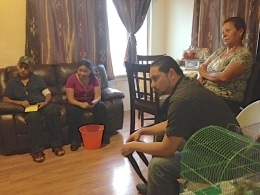 In addition, CES staff provided tenants with information about green cleaning approaches that would better protect the health of their children from toxic chemical dangers. CES Affordable Housing Tenant Organizer Edward Gutiérrez said, "The pest infestation is a huge problem at this site because no matter how meticulously tenants clean there are structural issues that allow the roaches to come back. It's not the tenants fault and they are frustrated beyond belief. 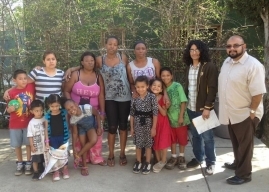 What motivates me to continue my effort is knowing that these wonderful families deserve better healthier housing and they are committed to organizing and fighting for it." 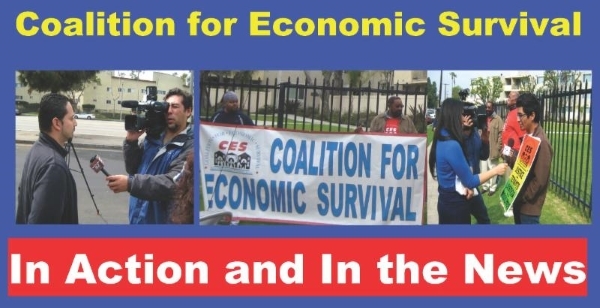 The Coalition for Economic Survival participated in a demonstration organized by the United Food and Commercial Worker Union Local 770 at the El Super market on Gage Ave in South Los Angeles on March 7, 2014. Workers are demanding a fair union contract. 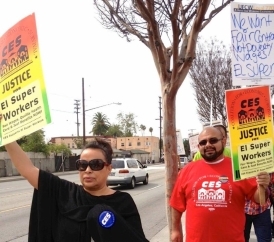 El Super employees have been asking for respect on the job, guaranteed hours per week and support for seniority, decent wages, health benefits and union representation for all El Super stores. CES Lead Affordable Housing Tenant Organizer Joel Montano, who spoke at the event, stated, "It was inspiring to see the tremendous turnout from community allies, such as CES, who provided support for the determined El Super workers. It sent a loud and clear message to management that the workers were not alone and that they had the community behind them." the Rents of L.A. Tenants! "This motion is like a direct attack on low-income and working renters in this city. It's ludicrous," said Larry Gross, executive director of the Coalition for Economic Survival . Council Member Parks Wants to Bring an Economic Earthquake to LA Renters! 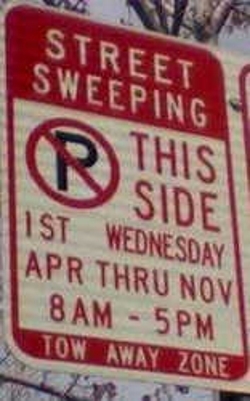 And Council Member Parks Wants to Make it Even Higher! Contact Your City Council Member to Urge Them to Oppose Council Member Parks' Earthquake Proposal Which Will Raise Your Rent and Might Displace You! 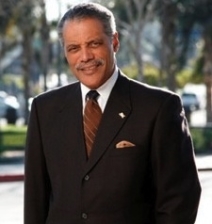 LA City Council Member Bernard Parks' motion is a direct attack on low income and working renters in this city. 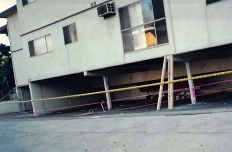 Parks wants tenants to bear the full burden of any earthquake retrofitting costs, while giving landlords a complete free pass and providing them significant rent increases by allowing them to by-pass rent control laws. Under the guise of saying he wants to provide earthquake safety, Parks action will shake up the lives of tenants with a massive economic earthquake. Other Council Members, and even the Apartment Association, are seeking state bonds funds to pay for the retrofitting in an effort to avoid economic calamity to both tenants and landlords. Yet, Parks states he wants a simpler solution. And that simpler solution is sucking more money out of the pockets of those who can least afford to pay. Parks also appears to be confused about the rent control law. He states that he wants to allow landlords to recover the full costs of the retrofitting, not just 50%. 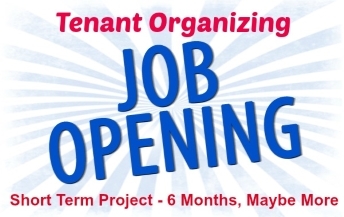 But, the rent control currently allows that for this type of work, but there are protections to tenants built in to cap the rent increases and to provide for temporary or permanent relocation benefits. What it appears that Parks really wants to do is to eliminate those tenants protections by getting rid of the rent increase cap and relocation benefits. With over 60% residents tenants, Los Angeles is a city of renters. 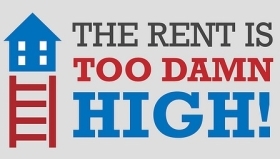 Unfortunately, over 50% of renters are paying unaffordable rents. They can't afford to pay more. But, Bernard Parks wants them to. 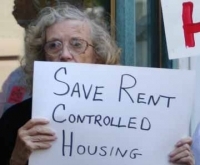 Tell the LA City Council to Oppose Bernard Parks Rent Increase Proposal. Help Make This Outrageous Proposal Dead on Delivery to the City Council. * In case the email bounces back from a specific Council Member, please call the office of that Council Member to get the correct email address. CES Executive Director Larry Gross Gets Sworn In as a City of LA Board of Animals Services Commissioner After the LA City Council Provided a Unanimous Vote to the Appointment by LA Mayor Eric Garcetti. Los Angeles Mayor Eric Garcetti recently appointed CES Executive Director Larry Gross to the LA Board of Animal Services Commission and on February 18, 2014, the LA City Council unanimously approved the appointment. Gross, together with two other recently approved Commissioners, Jennifer Brent executive director at the Jason Debus Heigl Foundation, an animal-welfare group started by actress Katherine Heigl and Roger Wolfson, a television writer and former aide/speechwriter to several US Senators, will join Attorney David Zaft and LA Manager of the Humane Society's Pets for Life Alana Yañez on the Commission. Among its duties, the Board of Animal Services Commissioners oversees and sets policy for the LA Department of Animal Services, which administers the city's animal shelter system, permits, animal licenses, spay/neuter, micro-chipping and vaccination programs, and animal control with a $21.7 million annual budget. Prior to the City Council hearing, in addressing the Council's Personnel and Animal Services Committee on January 21, as part of the confirmation process, Gross stated the need to fulfill the pledge for Los Angeles to become a "No-Kill" city by ensuring that dogs and cats, both adopted and homeless, are spayed and neutered, as well as the need to make it easier for people to adopt and care for their dogs and cats. "This being a City of renters, with 62% of our residents' tenants, we must facilitate the adoptions in rental units. 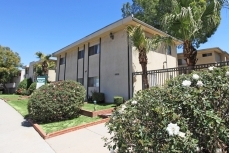 That means seeking cooperation and understanding between tenants and landlords," Gross said. The first Board of Animal Services Commission meeting Gross will participate in is scheduled for Tuesday, February 25, at 7:00 pm at the East Valley Animal Shelter. On February 5, 2014, the California Public Utilities Commission (CPUC) unanimously voted to re-appoint Coalition for Economic Survival Executive Director Larry Gross its Low Income Oversight Board (LIOB). The State Legislature established the LIOB to advise the Commission on low-income electric, gas and water customer issues, and to serve as a liaison for the Commission to low-income ratepayers and representatives. The LIOB oversees the state's privately-owned utilities low- income rate discount and energy efficiency programs. In proposing Gross for the re-appointment and demonstrating how the LIOB provides assistance to the CPUC, Commissioner Catherine J.K. Sandoval reported that Gross was responsible for a LIOB training on lead paint hazards by LA Healthy Homes Collaborative head Linda Kite which led to the CPUC adopting training standards for its contractors performing energy efficient remediation and weatherization work. Mr. Gross was first appointed to the LIOB in January 2012. Chinatown tenants meet with CES, LTSC, LA Housing & Community Investment Depart & Council Member Gil Cedillo's office to discuss the tenants being illegally relocated by the landlord. The Coalition for Economic Survival (CES) has been working together with LA City Council Member Gilbert Cedillo's Office, the Los Angeles Housing and Community Investment Department (HCID) and the Little Tokyo Service Center (LTSC) to assist tenants illegally displaced from their Chinatown apartments by a landlord renovating their building. The landlord violated numerous provisions of the Primary Renovation Ordinance which requires a landlord to file a Tenant Habitability Plan (THP) outlining the work to be performed, the time it will take and whether the work require the tenant to be temporarily relocated at the landlord's expense. 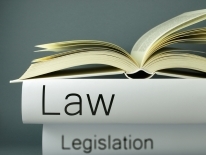 Some of the violations committed by the landlord included relocating tenants prior to the work commencement date, commencing the work prior to the approved date and not amending the THP to provide information on where the tenants were eventually relocated to. Most of the tenants are seniors and monolingual Chinese speakers. Many were taken advantage of because they did not understand their rights and were not provide information in Chinese. 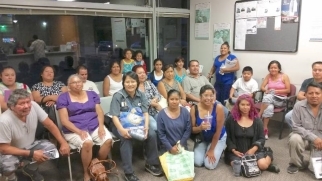 CES Rent Escrow Account Program (REAP) Coordinator Lourdes Soto, together with LTSC's Vivian Lee who provided translation assistance, has been assisting tenants to ensure they know they rights and helping them participate in the various City hearing pertaining to their case. HCID held a recent hearing on a THP appeal by a tenant. The City made a determination citing the landlord violations and instructed the landlord to take specific actions that will protect the tenants and uphold their rights. HCID is also in the determining whether to provided tenants with a REAP rent reduction based on the housing code violations that existed at the building. 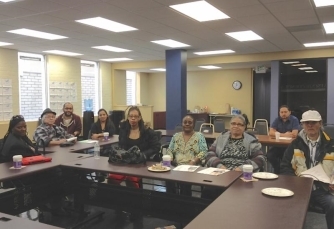 CES HUD tenants leaders from across the city met on February 8th to discuss issues that were impacting them at their apartment complexes and explore ways they can work together to make their housing better, as well as preserving it as affordable housing. 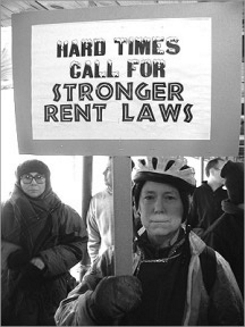 Tenant leaders came from the Vermont Square, Exposition Park, Central Alameda and Arlington Heights of Los Angeles. They talked about how they could enhance their collective voices and secure better housing conditions. They discussed a range of habitability issues such as deferred maintenance that can lead to illnesses and hardship for low-income families. The tenants understood that in order to be successful in making positive changes they needed to establish communication and work together to defend tenants' rights. They also decided they wanted to participate in broader issues such as involving themselves in current campaign to increase minimum wage and amend the state Ellis Act, which contributes to the destruction of affordable housing and the displacement of tenants. Coalition for Economic Survival Director of Organizing Carlos Aguilar travel to Sacramento to participate in the 5th Annual California Healthy Housing Coalition Conference joined fellow members of the California Healthy Housing Coalition (CHHC) held on February 3 and 4, 2014. CHHC is a state-wide alliance of community advocates and housing code enforcement government officials that are working on improving health and housing conditions throughout the state. CES is a member of CHHC. Boyed by the success of last year's passage of SB 488, a state bill that grants local code enforcement officers the authority to cite for pest infestations if there's no existing agreements for the heath services with another government agency, CHHC members also took to the halls of the State Capitol to speak with State Legislators about the need for additional legislation to improve pest management, reduce pesticide use in rental housing and more effective ways to address mold-related problems in the home. 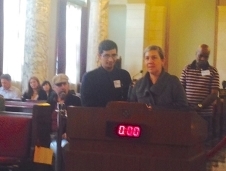 The Coalition for Economic Survival joined with other allies in providing support to the effort to raise the minimum wage in the City of Los Angeles being spearheaded by the LA County Federation of Labor and the hotel workers' union, UNITE HERE Local 11. The groups recently visited the LA City Council to seek supporters. 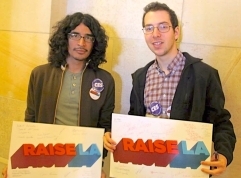 The campaign, named RAISE LA, is focused on raising wages for the city's hotel workers. Union organizers say the hotel industry's record number of visitors is why more than any other sector, is able to offer workers a living wage. 3/4th of the full-time labor force residing in the City of LA earn less than comparable workers 30 years ago. Wage erosion was greatest for workers in the bottom half of the wage scale. The average hourly wage for all workers residing in the LA in 2013 is estimated to be $27.85 or $58,244 annually. 46% of LA's wage and salary workers are paid less than $15 an hour. 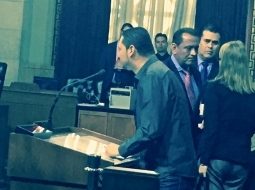 On February 18, LA Council Members Mike Bonin, Nury Martinez and Curren Price introduced a measure to the City Council seeking an economic study to justify enacting one of the highest minimum wages in the country - $15.37 for workers at big hotels. Hotels with workers who are unionized would be exempt from the law. 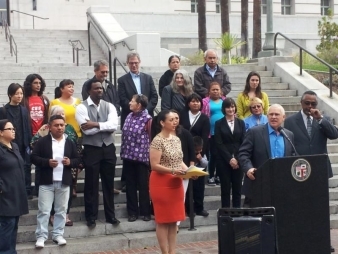 LA Council Member Mike Bonin announces a motion for study to increase LA minimum wage with Council Members Nury Martinez (left) and Curran Price (right) on the steps of LA City Hall. Labor and community groups, including CES, are on hand to provide support.